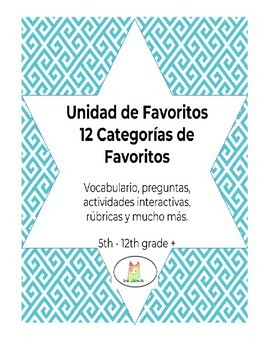 In this versatile unit you will find 12 main categories of favorites in Spanish and more: colors, numbers, pets, farm animals, wild animals, holidays, seasons, foods, beverages, deserts, fruits, school subjects, sports, extra-curricular activities, hobbies and sports teams. 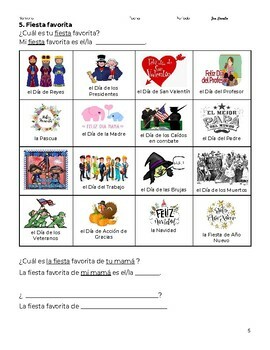 Each category has question and answer formats. There are interactive activities that give your students a chance to practice speaking, writing and reporting about others. There are directions, notes to teachers and rubrics included, as long as some models. The packet has 17 pages of useful vocabulary and activities. 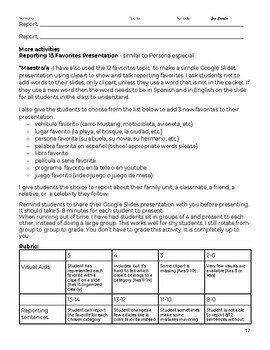 Also, you will find that 2 activities in this packet would help you out if you end up needing a sub.